Felix Gomez shoved aside a rack of hanging costumes and looked around backstage in the auditorium of Thomas Jefferson Middle School. He had been the drama teacher at the school for a few years now, and he really wanted to do something different this year. He would put on a new play, he decided, not just the same old, same old. Tasked with revitalizing the school’s sagging theater program, he had spent weeks reading new plays, but so far nothing had grabbed him. Then it started—an inexplicable urge, at first vague, then specifically focused on the backstage area of the school’s auditorium. Gomez had no idea why he was drawn back there, but somehow he knew that the obsessed, panicky state of mind that had gripped him for days now could only be eased by searching there. In a dark corner, buried under long-discarded props and scenery, Gomez spotted an old steamer trunk. He knew instantly that this was what had been calling out to him, driving his obsession. Throwing open the trunk, his hand—feeling as if it were being controlled by some other force—reached in. He pushed aside old props and grasped a stack of pages, bound together by three rusted metal fasteners. But as Gomez read the play, the force that had driven him here battled with a new feeling, one of inexplicable anxiety and horror. The more he read, the more intense the feeling of dread grew. Somewhere deep inside, he knew there was something wrong with the play. Gomez stood and hurried to the trunk to put the play back where he’d found it. Feeling a sudden sharp pain in his ankle, he tripped over a low stool that he was certain had not been there a moment before. He crashed to the ground and clutched his right leg in pain. Bree Hart paced up and down the center aisle of the Thomas Jefferson Middle School auditorium and nervously twirled her curly dark hair around her finger. The meeting for students interested in auditioning for this year’s play was about to begin. The auditorium was filled with energized students, busily chatting, eager to know what the play would be about. Bree had never felt this way before. She was equal parts excited and terrified. “Trying to wear a hole through the carpet?” asked someone from behind Bree. She spun around to face her best friend, Melissa Hwang. Bree thought about her older sister, Megan, who had gotten the lead in every school play since the third grade. Melissa was right. It was time for Bree to take center stage. “Anxious to begin your new life in the theater?” Melissa quipped. Just then the auditorium door swung open. “And here he is,” Melissa said. But instead of Mr. Gomez, a tall woman strode slowly down the center aisle, carrying a large briefcase. As she passed, Bree noticed the dark circles around her eyes and her jet-black hair. “Who’s that?” Bree whispered to Melissa. Melissa shrugged. The woman climbed the steps to the stage and walked out to the center. Adjusting the single microphone that had been set up for the auditions, she spoke in a surprisingly pleasant and gentle voice. A buzz went through the crowd. Mr. Gomez was one of the most popular teachers at the school—many of the students sitting in the auditorium that afternoon were there because of him. Bree could hear the sighs of disappointment throughout the room. “I was really looking forward to working with Mr. Gomez,” she moaned. One by one the students walked onto the stage, each taking a copy of the play. Bree felt a thrill run through her when she turned and looked out into the sea of empty seats in the auditorium. She pictured herself in the lead role, standing before a cheering crowd, taking her bows, curtain call after curtain call. “Are you all right, Gabrielle?” someone asked, startling Bree back to reality. 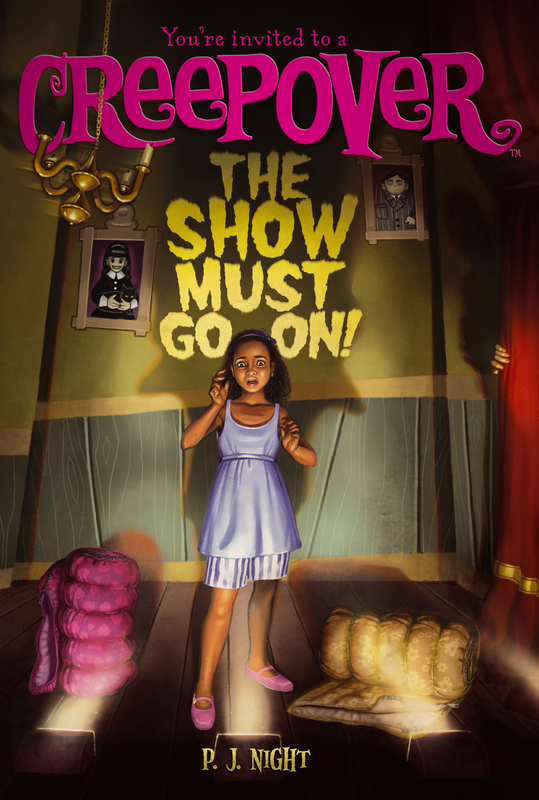 “Oh, yes, sorry, Ms. Hollows,” Bree said sheepishly as she picked up a copy of the play and hurried off the stage. Only after she left the stage did Bree realize that she had never told Ms. Hollows her name, especially not her real name. Everyone, except her mother sometimes, called Gabrielle Hart by her nickname, Bree. How did she know? Bree wondered. “Weird,” she said under her breath. “What’s weird?” Melissa asked, falling into step with Bree. Later that evening Bree curled up in a big, overstuffed chair in her living room and opened the script. “The Last Sleepover,” she read aloud. “By M. P. Wormhouse.” Bree read on. CARRIE: Thanks for coming tonight. Ready to hear something creepy? CARRIE: Years ago, a girl named Millie lived in this house. She was a shy girl who kept to herself most of the time. Although she didn’t have a lot of friends, the thing she wanted most in the world was to be invited to a sleepover. She dreamed about hanging out all night in her pajamas, in a sleeping bag, telling stories, eating, laughing . . .
CARRIE: Having pillow fights. All the cool stuff we’re doing tonight. Anyway, Millie waited and waited until finally a girl named Gabby had a sleepover. Gabby invited every girl in her class—every girl, that is, except Millie. CARRIE: I know. Gabby was a bit of a bully. Millie begged her to be allowed to come to the sleepover, but every time she asked, Gabby said no. CARRIE: I don’t know, but that sleepover was only the first of many. At least twice a year, Gabby had a huge sleepover, and each time all the girls in the class were invited except Millie. Then Millie got sick. Very sick. In time she died, having never gotten her wish to attend a sleepover. LAURA: That is so sad! RACHEL: It is. But where does the creepy part come in? CARRIE: I’m getting there. Millie’s family moved shortly after her death and sold this house to another family. That family had a little girl. One night, that girl had a sleepover. And that’s when the haunting began. Lights flickered on and off, and a strange face appeared outside her bedroom window. RACHEL: Yeah, right. You’re making this up. CARRIE: I’m not. Promise. I heard the whole story from the old woman who lives next door. She remembers Millie. They went to school together a very long time ago. CARRIE: It gets creepier. Every girl who has had a sleepover in this house since Millie died has experienced the same things. It’s said that Millie’s ghost haunts this house and will keep haunting it until she is allowed into a sleepover! RACHEL: Well, she’s not getting into this one! CARRIE: Nope. Not if I have anything to say about it. As Bree continued to read the play, she began to get more and more creeped out. “This play is so dark . . . and there’s something else I can’t quite put my finger on,” she murmured to herself when she had finished reading. She set the script aside. “I wish Ms. Hollows was putting on a happy play, with singing or something. Maybe I should wait to audition next year.” But that didn’t make Bree feel any better either. Bree recalled her English teacher describing the feeling of being outside your comfort zone. That the best way to learn and grow was to do something that felt difficult or unfamiliar. Maybe this was the play for her, and maybe she was destined to play Carrie. Bree described the strange story of The Last Sleepover to her sister. “Sounds creepy,” Megan said when Bree had finished recounting the plot. Bree picked up the script and stormed off to her room. She would show Megan! But that night, as Bree drifted off to sleep, she had to admit to herself that she did feel nervous. She couldn’t shake the haunting presence of the play and its characters. They felt so real, as if they had entered her life, not as words on a written page but as real people, including a very real-seeming ghost. She spent the night, tossing and turning, her dreams blending with her waking thoughts. It was the first of many restless nights.